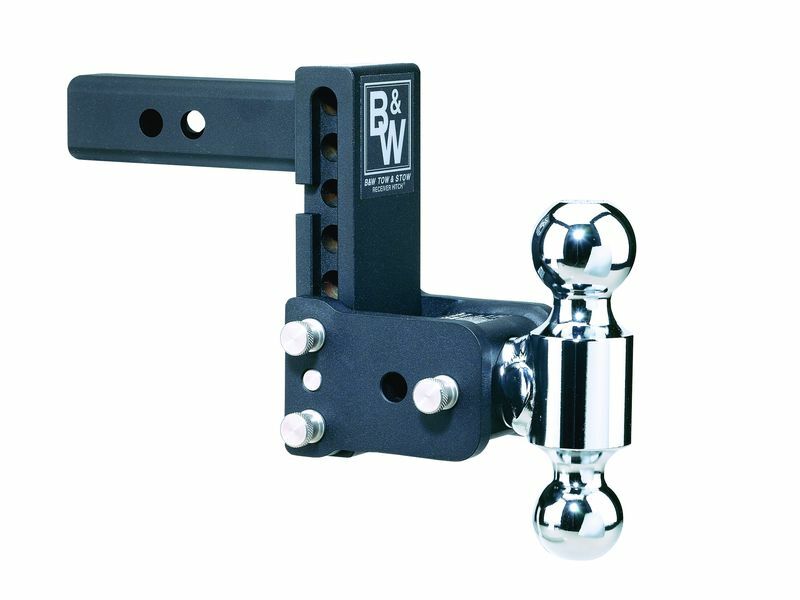 A B&W Tow & Stow adjustable ball mount is the only hitch you will ever need. Multiple ball sizes are available in dual or tri-ball configurations. Eliminate the need for multiple ball mounts. These B&W hitches are available in chrome or a durable two step E-coat and powder-coat finish which provides improved corrosion protection. The receiver's drop ranges from 3" - 9" and the rise ranges from 3.5" - 9.5". Adjustable in 1" increments. Excelent for towing heavy load with 10,000 gross trailer weight and 1,000 tongue weight. If you want one hitch receiver that will easily hook up any trailer you have or might ever have, go with a B&W Tow & Stow Adjustable Ball Mount hitch. Tow with confidence - Tow safely - Tow with B&W - And remember to never exceed the tow ratings of your truck. The B&W Tow & Stow Adjustable Ball Mount hitch are simple taking a minute at the most to install. If you have any questions please let us know at 877-216-5446.